"Bang Bang" is a song recorded by British singer Jessie J, American singer Ariana Grande, and American rapper Nicki Minaj. It was written by Minaj, Max Martin, Savan Kotecha and Rickard Göransson, and produced by Martin, Göransson and Ilya, with Kuk Harrell serving as a vocal producer. The song was first sent to hot adult contemporary radio on July 28, 2014 through Republic Records and released as a digital download the next day by Lava and Republic Records as the lead single from Jessie J's third studio album Sweet Talker (2014). It is also included on the deluxe version of Ariana Grande's second studio album My Everything (2014), serving as the third single from that album. In August 2015, "Bang Bang" was certified 5× platinum by the RIAA. As of 2016, the song has sold 3.2 million copies in the US. "Bang Bang" debuted at number one in the United Kingdom and reached the top ten in fourteen countries including Canada, Australia, Ireland, New Zealand and the United States. The single was nominated for Best Pop Duo/Group Performance at the 57th Grammy Award (2015), and won Favorite Song of the Year at the 2015 Kids' Choice Awards. 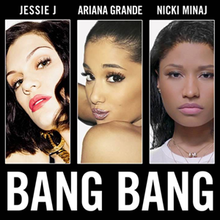 This page uses material from the Wikipedia article "Bang Bang (Jessie J, Ariana Grande and Nicki Minaj song)" (contributors) which is released under the Creative Commons Attribution-Share-Alike License 3.0.